The one thing I was slightly disappointed in, was the fact that they replaced the beautiful Artisan KitchenAid mixers – check out the twitter reaction here. I personally prefer the KitchenAid, I love mine and even though I have only had it for a short amount of time – it has revolutionised the way I cook. Anyway, so it was cake week on the Great British Bake Off. I found this out earlier in the day and it gave me a huge craving for cake so I decided to bake these beauties before the show! I am really into Matcha Green Tea recently. I was developing a bit of a wicked coffee habit, and have been turning to Matcha Green Tea for my caffeine kick. Matcha Green Tea is so much better for you than coffee. It is made from whole Matcha Green Tea leaves which are dried and then ground into a fine powder. This has been traditionally drunk in Japan for over 900 years and is packed with antioxidants, minerals and vitamins. It isn’t as cheap as PG tips, but you only need around 1/4 tsp per drink so a pot lasts ages I drink mine mixed with hot water and I love it. It really picks me up and helps me concentrate – who doesn’t need that? It’s like my Monday morning saviour. I have never baked with it, but have always thought it would look so pretty in cupcakes. This recipe is quite a good way to introduce Matcha into your baking life. It imbues the icing with a subtle Matcha flavour and is a great natural food colourant. 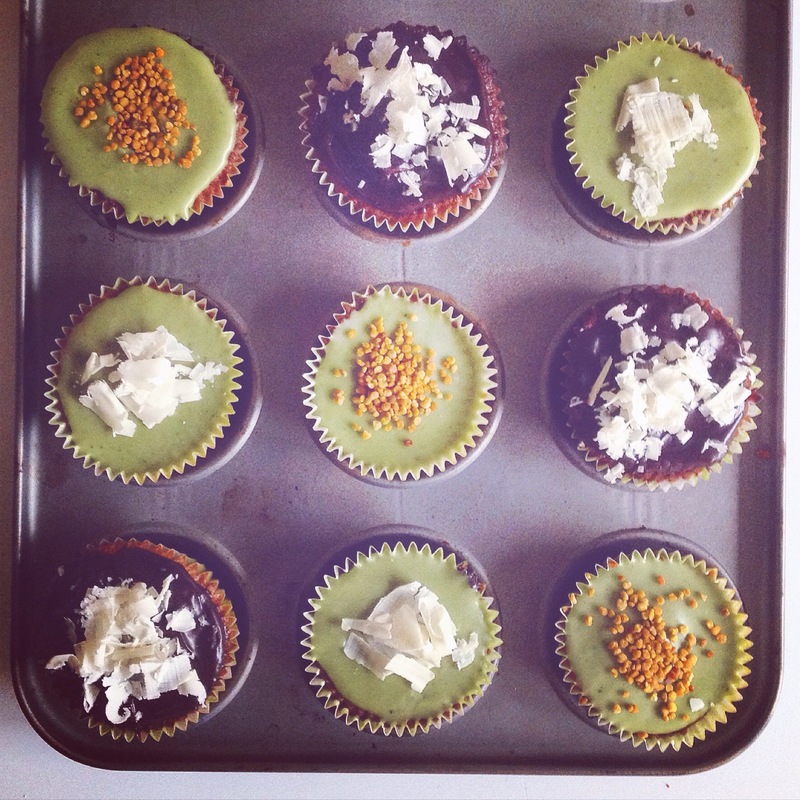 I topped the Matcha Icing with a mixture of bee pollen and white chocolate shavings. So. Pretty. I also topped some of the cupcakes with a rich chocolate ganache, because you know…why not! These look so decadent. I topped with white chocolate shavings. There were six of these cupcakes, but two were scoffed before I could photograph them! These cupcakes are perfect for lots of occasions. Birthday parties, hen nights, anniversaries, etc. I took mine to work and they seemed to go down very well! Pre-heat the oven to gas mark four. Line a cupcake tray with cases. In a bowl cream together the softened butter and xylitol until light and fluffy. Add the eggs one at a time. If the mixture looks like it is curdling, then add a spoonful of the flour. Add the rest of the flour and the vanilla power and mix well. Finally add the milk and mix until you have a soft dropping consistency. It should be neither too stiff nor too runny. Spoon a dessertspoonful of mixture into each cupcake case. If there is any mixture left over, simply divide between the cakes. Bake for around 15 – 20 minutes until golden brown. Stick a skewer in and ensure it comes out clean. The cakes should feel spongy. Allow to cool before decorating! See below for my icing tips. 5 tsp tepid water. This is really a guide. Just add a bit of water at a time until you have the consistency you require. Sift the icing sugar into a bowl. Add the Matcha Green tea. Slowly add the water and stir until all ingredients are combined. If needed add more water to achieve a thick, runny consistency. Spread over the cooled cupcakes. Sprinkle with bee pollen! Melt the Chocolate carefully in the microwave. You can use a bain marie, but microwaving is so much easier. Stir in the stevia and the cream until you have a spreadable consistency. Optional toppings: White Chocolate, Bee Pollen, Sprinkles, Chocolate chips etc. And that’s it! Super simple and super tasty. I hope you enjoy this recipe and you all have a lovely week! Posted on August 9, 2015 January 10, 2016 by TinaManahaiPosted in Cupcake CornerTagged bake, baking, Cupcakes, GBBO, Healthy, kitchenaid, Matcha, tea, Xylitol. Other optional toppings could include sweetened red bean paste.